Allen Susser was one of the original pioneers of what has been variously called the "Mango Gang" or "Floribbean" or "New Florida" cuisine back in the late 1980's, along with such illustrious names as Norman Van Aken, Douglas Rodriguez, Mark Militello and Jonathan Eismann. While each of his compadres has had restaurants come and go over the years, Chef Susser is now running on a 23-year stretch at his original location in North Miami Beach (n/k/a Aventura), Chef Allen's - a truly remarkable feat given the failure rate of most restaurants. It had probably been close to a decade since I'd last been to Chef Allen's, and I'll confess that I didn't miss it that much. What had seemed creative 20 years ago instead just seemed old-hat and uninspired on my last couple visits. The restaurant, its menu, and its clientele all seemed somewhat dusty and dated. A rather formal atmosphere seemed stilted and out-of-place. Perhaps hearing the refrain of "What a drag it is getting old," about a year ago Chef Susser gave Chef Allen's a major makeover. The dining room was updated and made both more contemporary and more casual, and the menu was given a major tweak to become a "Modern Seafood Bistro." I figured it was time for a repeat visit. Chef Susser has not abandoned the mango entirely. Indeed, with South Florida in the middle of mango season, they could be found literally everywhere: each table in the restaurant had as its centerpiece a fresh mango. And, among many clever marketing gimmicks, Chef Susser offers a free dinner for two to anyone who brings in a wheelbarrow full of mangos to the restaurant. Given what a prolific season we're having, I suspect that there have been several folks who have taken advantage of that offer. But the menu is not as reliant on the tropical fruits that were one of the calling cards of the original "Mango Gang." Picking up on a few prevalent local trends, Chef Allen's now offers an extended selection of smaller dishes, some of which are "snack"-size and others more customary appetizer portions, with mains focusing on locally sourced sustainable seafood and steaks cooked on a wood-burning grill. For us, the most interesting sounding items all resided in the "starters" section of the menu, so that's where we stayed, ordering six items (ranging in price from $4 to $11) to share plus a vegetable side. Devils on horseback (bacon-wrapped dates, a/k/a the Official Snack of the Design District) were wrapped with nice meaty bacon, and stuffed with Manchego cheese instead of blue as we've seen elsewhere (much to Mrs. F's satisfaction, as she doesn't like blue cheeses), and also used a fatter, plumper date than we've had in other iterations. Saffron arroncini were a very pleasant surprise, little balls of saffron-inflected risotto given a crispy coating and fried. These were smaller than most arroncini I've had (I'd say tater-tot size) which gave a nice ratio of crispy exterior to creamy rice interior; the accompanying tomato jam I found to be a little too sweet. A tuna poke (a traditional Hawaiian dish of cubed raw tuna somewhat similar to a ceviche), marinated with tangerine segments, soy, ginger, and mint, and sprinkled with wasabi-spiked caviar, was something of a disappointment, the cubes of tuna a little chewy, and the flavor of the citrus somewhat overwhelming. 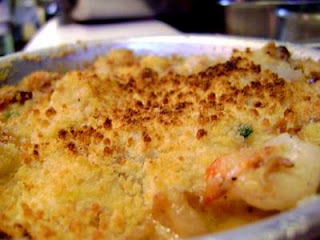 This one flop was made up for by the shrimp & grits "brûlée", a delicious dish even if it is completely unlike any lowcountry shrimp 'n' grits. Instead, wild Florida shrimp are paired with some creamy Anson Mills grits, which are supplemented with Manchego cheese, cubes of tomato, bacon lardons, and shallots, piled into a ramekin and then run under the broiler until it's toasty and browned on top. I'd swear there were some unadvertised bits of lobster meat in the mix as well. This was a delicious dish which alone was worth the trip (and definitely worth the $10 price). We also liked the Kyoto clam "hot pot," a generous portion for $10 of little, firm, meaty clams, steamed open in a broth of soy, sake, scallions and red peppers, with an unorthodox addition of sweet cooked bananas. Mrs. F liked everything about the dish but the bananas - they didn't offend my sensibilities, I'd even go so far as to say I liked them. If nothing else, I appreciate the boldness of the pairing. A side of a spinach fondue was too heavy on the cream and cheese, and too light on the spinach, to be considered a bona fide "vegetable side." Though it was good, it was perhaps overwhelmingly rich, though that didn't keep me from dunking bread even after all the spinach was gone. Entrees mostly ranged from $20-30 but were a somewhat limited and - to us, at least - unexciting selection. While fish got an entire page of the menu, including a praise-worthy statement of commitment to sustainable fish and seafood, the offerings included only four fish options (snapper, yellowfin tuna, mahi mahi, and yellowtail), a fried calamari dish, a pasta dish featuring shrimp, and, perhaps most intriguing, a "surf & turf" with grilled shrimp and beef short ribs. The non-fish entrees also play it pretty close to the vest - skirt steak with chimichurri, filet with red wine demi-glace, burger, shortribs, pork chop, chicken paillard. But that was OK, as our multitude of starters turned out to be plenty of food to make a meal, and is the way we often like to dine. And the price was certainly fair, with the food portion of our bill being under $60. Mrs. F vetoed dessert, which is too bad as I do have fond recollections of Chef Susser's "Kit Kats" dessert. The $25 corkage fee was money well spent, as the 2002 Hudelot-Noellat Chambolle-Musigny Les Charmes I brought was freaking awesome, if I may say so. Aside from the recent menu overhaul, Chef Allen's does a good job of finding other ways to bring folks in. Throughout the summer they are offering free interactive cooking classes on Fridays from 6pm-7pm (conveniently before dinner time, you'll note), on Father's Day they're offering to let Dad cut his own steak to be grilled on their Lyonnaise wood-burning grill, and every Wednesday is "Wine Down Wednesday" with all bottles on the list offered at half price. You don't stick around for more than twenty years in the restaurant business without learning a few new tricks along the way, and it's reassuring to see that Chef Allen's keeps working on ways to keep things fresh. [*]OK, Miami restaurant historians: years ago (10+) there was, briefly, a restaurant on Lincoln Road called Lure which had sushi and an odd but good Asian/Mediterranean menu. They made one of the best caesar salads I've ever had, with a tahini-based dressing and tempura-fried anchovies. The only online reference I can find to it is in this article from 1997. Any idea who was behind the place? i think it was the space now occupied by solstice. they had these great fishing rod-like lamps. i loved the food, but always went back for the basil mango cheesecake. can't remember the chef, but i think he went on to bigger and better things. ugggh, not going to sleep til i remember. It seems as though the 'unexciting' larger dishes could be there to maintain the 'old crowd.' It only seems fitting since you and your crew went for the more exciting new smaller plates. This is an interesting approach on his part and a very political one... as I am tending to think that way more and more. It seems very smart. Perhaps 23 years teaches you to walk the line with incredible balance. Those "lobster" chunks were Rock Shrimp. Glad you enjoyed everything, hope to see you back, or perhaps at a Pizza Crawl Part 2. We also had not been to Chef Allen's for quite a while until we tried it again last night and it will be quite a while before we go back. Our devils on horseback were too sweet, missing both the cheese and bacon flavor; the mango salsa served with the crab cakes was also very sweet and missing any 'salsa'. The caesar salad and shrimp and grits brulee were delicious; the best dishes of the evening. None of the main courses were particularly good, shrimp undercooked and served heads on, and my son's burger (which he didn't eat) had an off flavor. The server, who started off well, didn't come back to see if we were happy after the main courses came so we didn't bother to send it back and decided not to have dessert. I was hoping for a reprise of Paramount Grill which we used to enjoy at Aventura mall, but was disappointed. I can understand some of these complaints but not others. In particular, head-on shrimp is pretty universally a sign of freshness and high quality and for some of us there is no greater joy than sucking on those heads.